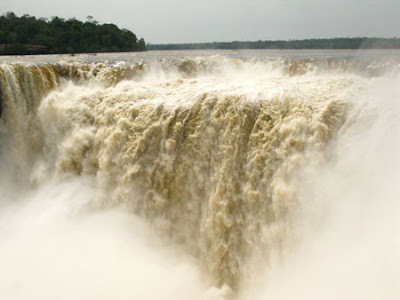 The thunderous roar of water crashing over cliffs into the river below told my husband Larry and me that we were nearing the end of the long metal and concrete bridge at Garganta del Diablo, the most incredible and powerful section of Iguazu Falls in Argentina. Powerful water roils over cliffs and sends up heavy spray. As huge sprays of water shot like geysers into the air, a chorus of “oohs” and “ahhs” from crowds on the walkway reflected their collective amazement. Onlookers jostled for space by the railings to get unobstructed views despite the forceful sprays of water blowing their way. It’s almost impossible to soak in the true magnificence of the sight, but we stayed long enough to etch it in our memories, and we returned the next day for more photos. Designated a UNESCO World Natural Heritage Site, Iguazu Falls and Iguazu National Park’s natural splendor and lush vegetation are worth seeing from either Argentina or Brazil. 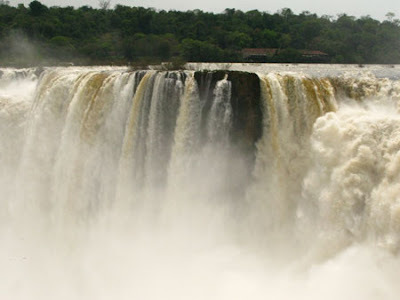 While viewing the Falls from Brazil allows for an amazing panorama, we opted to stay on the Argentina side because of its more personal and intimate opportunities to explore the area around the Falls. Any of the dozens of imposing waterfalls could warrant a national park of its own, and the scope of 260 waterfalls extending over 2700 meters is just unimaginable until you see it first-hand. 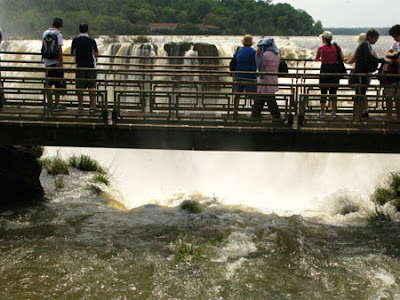 Having trekked the Lower Trail at Iguazu Falls and experienced close-up wet thrills on foot and by boat during our first day at the park, the following day we decided to walk around paths of the Upper Trail. We spent an hour taking in the incredible strength and beauty of multiple waterfalls. With so many outstanding views, it was hard to resist taking pictures (I topped 200 for the day). Afterwards, we walked to Estacion Cataratas (Waterfall Station) intending to catch the open-air train to Garganta del Diablo or Devil’s Throat. Faced with a long line and at least a 20-minute wait, we decided to walk the dirt path beside the railroad tracks, hoping to arrive before the train. But we didn’t beat the train. After half an hour, we arrived at the Diablo station and began the long walk on the bridge across the river to the most spectacular sight of all. Filled with sensory overload, we returned to the main station via train and then walked the paved, ecologically-sensitive Green Trail to the Visitor Center. Exhibits there detail geography, geology, and history of the Falls and park areas. A bit of shopping (beautiful jewelry made from native stones), hamburger lunch at the Jaguar concession, another afternoon walk on the Lower Trail, and relaxation time on our deck overlooking the Falls rounded out the day’s agenda. 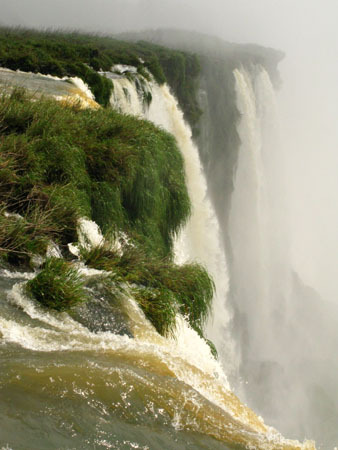 Plan to spend at least two days at Iguazu Falls to take in all the majesty of this natural wonder.